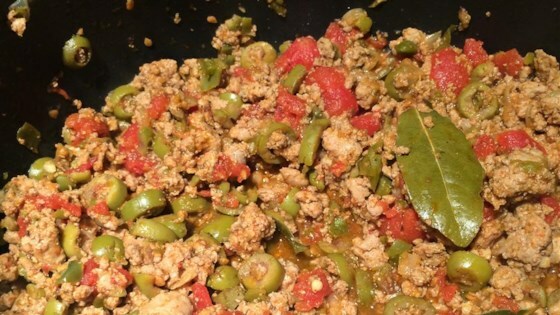 "My aunt introduced me to this delicious dish. In the past few years I've made changes and come up with what my family feels is the best Brazilian dish around! A great chili alternative and it freezes well." In a large stock pot, heat 1 tablespoon of olive oil over medium heat. Saute garlic, onion and green pepper until onions are transparent. Transfer onion mixture to a bowl and set aside. In the same pot, heat the remaining olive oil and brown the ground beef. The delicious Cuban comfort food! This was really great. Like others suggested, I used cumin and coriander and served it over white rice. My boyfriend already claimed the leftovers for his lunch tommorrow. We served it over baked potatoes. Good cold weather meal. I made this recipe for my husband and myself last week. I thought it was excellent. Very nice flavor. I served it with white rice.